A $23 billion global bio-pharmaceutical firm saved over $6 million annually while increasing their visibility and control. Prior to engaging with vMOX, the client was over their IT budget by 9%. Just four months later they were 37% under budget. One of the world's largest construction equipment manufacturers reduced their average cost per line by over 50%. $3M in annual savings was achieved with no provider changes, service disruptions, contract re-negotiations or compromises to the end user experience. 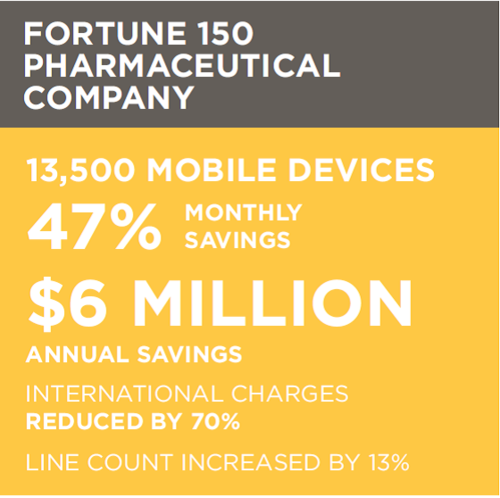 This savings was achieved despite the fact that, on average, the company added 40 new devices to their mobile environment each month. 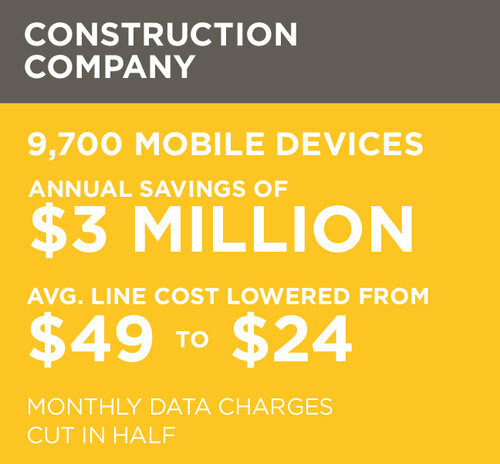 A leading U.S. general contracting firm saved over $3.25 million and streamlined their corporate mobile device procurement process. Their savings level remained high after contract renewal and baseline reset, highlighting the need for perpetual optimization. 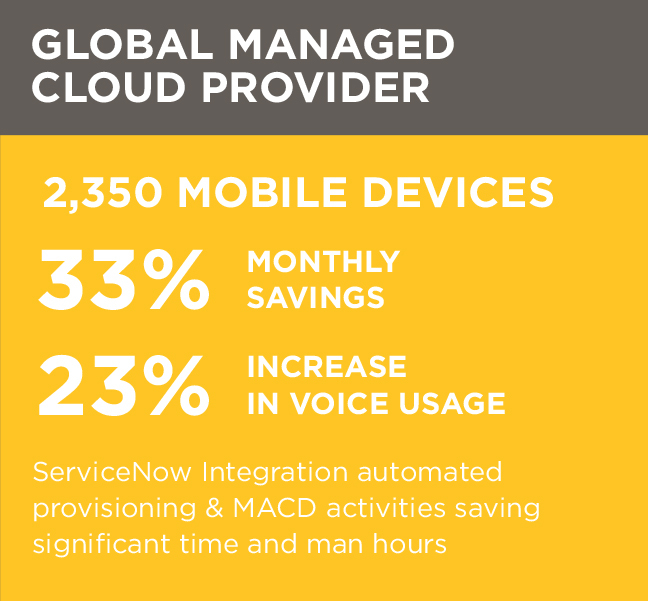 This global Cloud provider lowered their mobility bill by over 30% in the first two weeks under management. Integrating their service management system with the vMOX portal automated daily operations tasks, saving them significant time and man hours. A $600 million dollar global engineering, water management and drilling company lowered mobility costs by 42%. Along with the savings, the vMOX portal streamlined and centrailized all mobility management and reporting activities across their multi-provider mobility environment. Healthcare provider cut monthly spend by more than 50% and eliminated fraudulent employee device procurement activity. vMOX fraud detection and prevention identified employee abuse and helped client revamp internal processes and authorization layers to prevent future incidents. 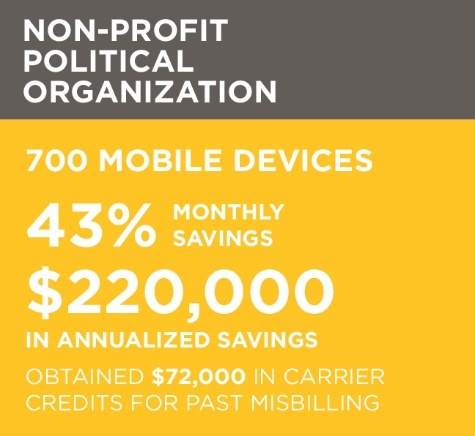 International non-profit lowered their mobility costs while greatly improving operational efficiencies. vMOX reduced monthly spend by 43% and uncovered over $70,000 in past carrier over-billing. A top business collaboration software provider realized over $17,000 in savings in the first month on vMOX's cost optimization platform. Integration with their corporate travel reservation system has lowered international roaming and feature charges by over 40% each month. $6.2B global chemistry company streamlined all provisioning and consolidated enterprise-wide reporting by using the vMOX portal. vMOX has helped them better administer their combined AT&T and Vodafone corporate mobile environment, while identifying over $25K in saving each month. Leading network equipment provider took control of the cost and management of their multi-provider corporate mobility environment. The $18K monthly saving uncovered by vMOX was above and beyond that found by their existing wireless expense management (WEM) provider. Well-known athletic apparel retail chain's monthly costs decreased as their line count increased. vMOX delivered over $80K in annual savings while simplifying device procurement and management for this rapidly expanding brand. Art gallery with locations in 7 countries saves 45% and takes control of their international charges. Integration with the clients travel system enabled vMOX to reduce international calling charges by over $4k per month.